Binion’s Gambling Hall and Hotel was built with “Old Vegas” in mind and caters to real gamblers and party goers who want the full Vegas experience while avoiding the often steep prices associated with the Strip. 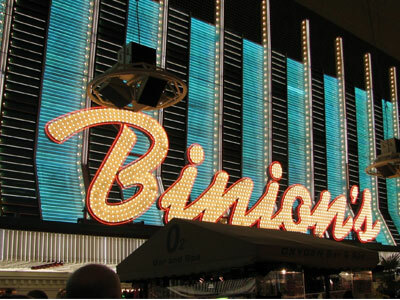 At 50,000 square feet Binion’s is located in the middle of the Downtown area right on Fremont Street. It is one of the larger casinos beneath the Fremont Street Experience, which is the world famous canopy over Fremont Street with shows nightly. In addition Fremont Street has live free concerts almost nightly along with several street entertainers and other attractions. Binion’s, as well as other casinos in the Downtown area, with perhaps the exception of the Golden Nugget, is not high end. Gambling is usually lower limits compared to Strip casinos. There are no services to speak of offered at Binion’s outside of cocktail service for gamblers. Binion’s also offers no entertainment itself outside of what is available on Fremont Street. There are no shows, lounges, or bars outside of the casino bar. While the property is 50,000 square feet, the gambling floor is smaller than Strip casinos and much of the property has been closed to the public since 2009. Note: The hotel portion of Binion’s is closed as of 2009. Currently there are no plans to reopen the hotel portion of the casino though this may change in the future. Currently the hotel floor is intact and plans have not been made to convert or tear down this area. Binion’s is best known as the birthplace of the World Series of Poker. This event has since moved, but Binion’s is still a favorite destination for Poker players and those who want to test their skills the world over. Table and slot limits are lower than Strip limits and are comparable to other Downtown Casinos. Gambling may be available for high rollers but not to the extent of Strip casinos. They feature a smaller Race and Sports Book with a “local” feel. Currently the hotel portion of Binion’s is closed. There are no plans now to reopen this portion of the casino, but it may open sometime at a future date as the TLC Corporation has not eliminated the possibility completely. All Downtown casinos feature lower limits compared to the Strip. In addition food and entertainment is also generally less expensive. Binion’s currently has no rooms available. For tourists who want to save money on their trip, Binion’s is an excellent choice for gambling, food, and drink. Drinks are always less expensive Downtown, and seasonally $1 drink specials may apply – these specials generally apply to all of the Downtown area as opposed to a specific hotel or bar. Note that bars may have their own prices even as the Downtown casinos offer specials on drinks. Cocktails are free to gamblers, tipping the waitress is customary however. Binion’s restaurants offer a variety of options at a great price. Their restaurants also receive excellent ratings from consumers both for quality and the price. Look for specials at certain hours of the day, usually very late at night and early morning. Some of the restaurants include; Ranch Steakhouse, Binion’s Café, Benny’s Bullpen, and Binion’s Deli. Binion’s has a small bar on the casino floor. Binion’s and most Downtown casinos feature drink specials most seasons including dollar margaritas and dollar well-drinks. These drink specials can vary and are usually available all of Downtown and are not specific to the casino. In addition drinks Downtown at all casinos, it should be noted, is significantly less expensive than the Strip at all times, often $5 to $10 and up less per drink. Binion’s is mainly a gambling hall with excellent drink prices. There are no specific shops associated with Binion’s Casino. They do have two gift shops within, similar to gift shops anywhere throughout Las Vegas. Binion’s is open 24 hours as are all casinos. Drinks are served 24 hours as well. There is not specific nightlife, lounges, or bars within Binion’s that can be considered nightlife, though the casino bar is open 24 hours. Binion’s no longer has a hotel. The only service offered is cocktail service to gamblers. Binion’s does not have a convention area or any place to hold special events of any sort. Binion’s pool closed with the hotel portion. Binion’s hosts no shows, but is located directly beneath the Fremont Street Experience. Binion’s does not have a spa or any similar services.